All about the best team in the land and all the world Manchester City!!! : Do new offices mean bigger stadium? After it was confirmed today that City have started building a new £6 million office suite at Eastlands to house staff that currently work inside the stadium, to me it looks like they are doing this to make room so that the stadium can be expanded. Maybe I'm reading into it to much but some things that Garry Cook and Jon Stemp had to say made me think that this is possibly the start of us being able to boost our stadiums capacity. ''By relocating our staff into fit for purpose offices, not only do we give ourselves the opportunity to enhance the supporter experience inside the stadium but we can also give our staff at the ground a working environment they can be proud of." Well it is clear that they are moving the staff that currently work inside the stadium to free up space, they don't actually say what they are making room for. I think to carry out all this work must mean that they want the space free to boost the stadiums capacity, surely that is the only sensible reason. If they are freeing the space up for something else that will improve the stadium, what could that something else be? Great to see some non-transfer support from the Sheiks though! How would moving office staff mean an increase in capacity? It couldn't. Cheers. Well actually if you think about it, it could. If they move all those offices from inside the stadium it would create an empty cavity, which they could then open up. it could do seeing as the removal of offices etc frees up space to move stands back towards the outer wall of the stadium, or for other facilities to be built within the stadium. In web page design you have committed the cardinal sin. The contrast of WHITE text on PALE BLUE background is a no no! Of course, being a fellow City fan the background colour is great. Please please change the text colour. With regards to expanding the stadium. I was told by by someone inside the club that it could be done in two ways. One is to extend the third tier around both ends. This could be done while the stadium is still in use. The other is to extend the bottom tier downwards. At the moment it is some way from the edge of the pitch. The pitch would be lower than it is now. However I was told that City would have to play elsewhere for 1 season. In total these two increases would put capacity up to about 65,000. Yeah I am aware that the white is a problem for some readers, I did ask older people with bad eye sight when making the blog if it was hard to read, I was told no. I have been told by younger people that it is easy to read. However I am aware it poses a problem for some readers and I am looking at changing it. I just need to find the time between doing articles and then my personal life to take a good look at it so I can decide what to do. Sorry for any problems you may have reading my blog at the moment, hopefully I can eventually find the right colour to replace it. Can I also ask my comment leavers to not swear please. Whilst I encourage people to leave their opinion, I do not want anyone that reads my blog to have to read swear words, especially any children that read my blog. Thank you. One in ten men are colourblind like me, white on blue is not easy to read. Bourbon biscuits > Custard Creams. I will hopefully soon have an email address on my blog, if people like yourself who are colour blind or otherwise could send me information on how it is easier for you to view my blog, I will gladly look into it. The biscuit question is a bit off topic, but I would have to say at a push custard cream, better with a brew. What many of us want is a STANDING section behind both goals for HOME SUPPORTERS. Why can some of the continental teams have standing / terraces? Perhaps they're building a new trophy room rather than the cleaners cupboard we currently keep our vast amount of trophies in ! I think there are longer term plans in the pipeline to expand the stadium. The obvious way to go forward with this is to remove the entire roof (in stages) and the 3rd tier. 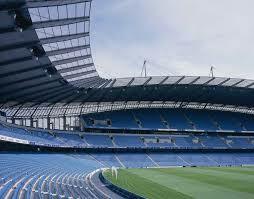 The 2nd tier could then be extended, and a new 3rd tier - wrapping right round the stadium this time - added. The new roof could then be added. In terms of expanding immediately, there is no reason why we could not apply for "safe standing areas" at either end of the stadium.Strict limitations on the numbers allowed in and staggered anti-crush barriers limiting crowd depth to 3 would make these areas safer than seating areas. This would increase the amount of singing and give a tremendous boost to the general atmosphere.